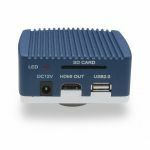 Scienscope Versa-Cam HDMI/USB 2.0 Camera is the next step in the evolution of our powerful line of digital HD cameras for microscopy. Free Version of Video Image Essentials Software included ($495 Value)! The Scienscope CC-HDMI-CD2 Versa-Cam Camera can be used as a live image HD (1080p) camera to a monitor using an HDMI cable or as a USB 2.0 camera with USB cable connected to any computer or Windows Tablet. Purchase a Scienscope CC-HMDI-CD2 1080p HDMI Camera Today!